Halloween is on Monday the 31st October, however some of you may be having Halloween parties over the weekend. We encourage responsible behaviour so please be mindful of where your children trick or treat; and always ensure they remain safe. Visit neighbours and people that you know Look out for pumpkins – houses that welcome trick or treaters usually have pumpkins on display Some people do not enjoy being scared by spooky costumes. If you see a “no trick or treat” sign respect it and move on to the next house. If you yourselves do not wish to participate, please find a poster attached that you may wish to print off and have on display on your windows or doors. We trust that the trick or treaters will be mindful of this. An elderly victim who lost tens of thousands of pounds to scammers has been helped by the police and County Council community services. 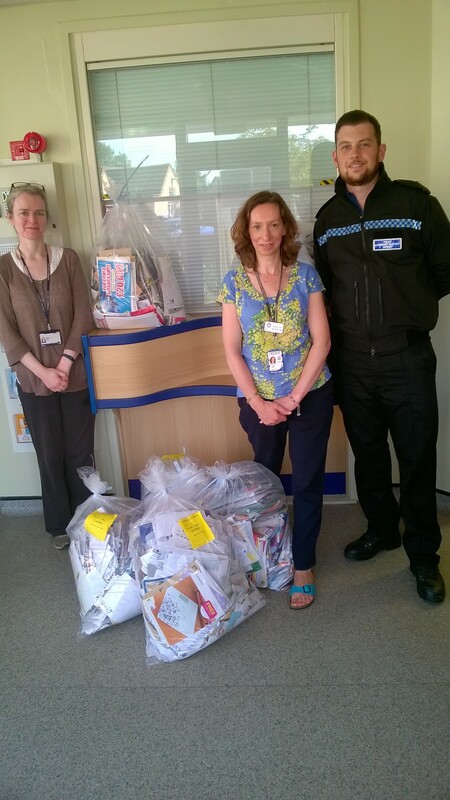 Now Cambridgeshire Constabulary and the County Council’s Community Protection team are urging residents who receive letters promising prize winnings and good fortune to treat them as ‘too good to be true’. The elderly victim was discovered to have been targeted by scam companies which tricked them into sending money for fake lottery and prize draws, health cures and psychic predictions. The hundreds of letters received by the victim appeared to be from legitimate companies, government departments and suchlike and were designed to dupe the victim into believing they were genuine. On investigation, PCSO Thomas Baugh and Crime Reduction Officer Rachel Carr found the victim had been sending money to scam companies over a period of years. They noted that on one occasion there had been several bank transactions amounting to hundreds of pounds within a two day period. Officers are now working to support the victim, who wishes to remain anonymous, including measures to help reduce the scam mail received and assistance in recognising and dealing with any scam mail that continues to arrive on their doormat. The National Trading Standards Scams Team has also been informed and are working to trace the money trails and identify the scammers involved. Elaine Matthews, Cambridgeshire County Council’s Community Resilience Development Manager says “Scam letters are carefully designed to look extremely convincing and genuine in order to trick their recipients into sending their hard earned cash. The reality is that money is usually used to fund organised crime such as drug trafficking, people trafficking, prostitution and terrorism”. Sgt Mark Rabel adds “If you have not been to, for example Australia and bought an Australian lottery ticket then you simply cannot have won a prize. Also a genuine prize draw would not request payment of a fee to release winnings. Beware of any unsolicited letter which suggests you are in line for a windfall if you did not enter the competition in the first place. If it sounds too good to be true then it almost certainly is”. If you think you or someone you know has been targeted by scams contact Citizens Advice on 03454 040506 www.consumerhub.org Also report details to Action Fraud as below. Think Jessica is a charity that works with victims and their families to highlight the problem of scam mail and telephone fraud. The conditioning methods employed by scammers, can result in the victim becoming more and more isolated. This conditioning is known as ‘Jessica Scam Syndrome’ (JSS) which is named after the charity founder’s mother who was a serious victim of scam mail. For advice information and support contact Think Jessica. We are appealing for information in relation to the thefts of 2 mobile portable saunas permanently housed on Ifor Williams trailers. The saunas were stolen from a secure yard of the business premises near Flint Cross, Melbourn. The mobile sauna units are very unique in their design. Both saunas together with their trailers were stolen between 1700 hours on Saturday the 8th October 2016 and 0700 hours on Monday the 10th October 2016. Vehicles will have been used to transport these trailers from the yard. The victims are offering a reward of £1,000 each for any help which would lead to the recovery of the Saunas. If anyone has any information regarding this crime please contact PCSO Leanne Fisher on Telephone number 101 or email leanne.fisher@cambs.pnn.police.uk quote crime reference number CF0457041016. Here is a picture of one of the Saunas which was stolen. Both are identical. However on one cover there is no writing. Call: 101 | Follow: @SouthCambsCops | Facebook.com/SouthCambsCops Visit: South Cambs Local Policing website or SouthCambsCops.org and read our blog!